I’m always telling my peeps, you have to be in it to win it, and lately, I’ve been practising what I preach. For starters, I got the lottery syndicate at work up and running, which if all goes according to plan, could make us millionaires by Christmas, and hey, even if it doesn’t, at least it will have given us temporary hope and happiness! It’s always good to have something to look forward to. However, today my luck is totally tangible and produces a prize! It all started a few days ago, when I entered Tenina’s competition on Facebook to dream up a noel-like name for her new Christmas cookery book. At the time, I was a tad tired and mightily uninspired, and all I could come up with was Chris-mixing. The competition was fierce with some top titles in the running, but guess what! 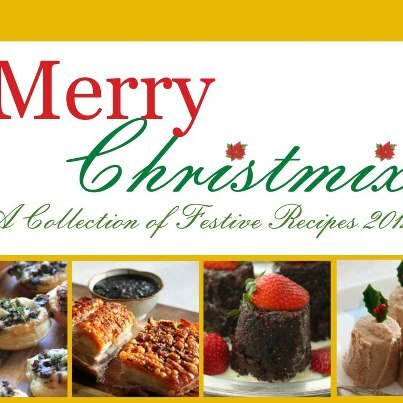 My words were winning, well, sort of, because Tenina’s Christmas cookbook is going to be called Merry Christmix. How cool is that?! I was so stoked especially when Tenina messaged me to tell me I can have a free copy of the book for my trouble! Being the brain behind the name was a treat in itself, but a copy of the cookbook too, wowee zowee! It really feels like Christmas is coming early to my house. It’s not even December and it’s turning out to be a cool yule! I’m in a bit of a festive frenzy just thinking about Tenina’s Christmas collection and I don’t even have it yet! In the meantime, while we’re waiting, why not take a sneaky peek at www.tenina.com but proceed with caution, Tenina’s recipes will make your mouth water!